I CAN HAZ A 'SONA!!! ladybattousai slaved away making this terrific 'sona just for ME! I am an OLD person (64) who adores the Kag/Sess pairing. I have done far more beta work than I have done writing, but I did indulge in a couple drabbles, which I have uploaded ONLY here and ebony_silks on LiveJournal. I am also co-owner and mod of the Yahoo!Group Demonlordlover2, a community that was started by Demonlordlover to discuss all things Sess/Kag. Membership is age-restricted because of some of her older stories on the site, but we're VERY easy to join! I have one husband, two (mostly) adult children, one dog and two cats. I live in a semi-rural area in Michigan, but close enough to Detroit to take in a concert every now and then (most often when the kids drag me). My husband, son, and I have started a family business doing powder coating (applying powdered paint to metal and baking it). Six years into the effort, we're ready to get out. Hubby is looking for another job & I just want to get back to managing this site and my household. I like to encourage new writers, but turn-offs are chat-speak, text-speak and a total lack of punctuation. I'm also more partial to those who take the time to run things through spell-check, at the very least. I know, it makes me sound elitist, but I'm actually pretty easy to talk to, mostly open-minded, and relatively understanding. Now that you're bored to death, welcome to my profile and give me a holler if you have any questions! PS - Also not a big fan of cliques, unnecessary drama, and people who fancy themselves to be somehow better than others merely by virtue of who they know. I'm more impressed by WHAT you know than anything else, 'k? Welcome to my Dokuga corner of TEH INTERWEBS! I am, and always will be, SO VERY grateful to Miss Kagura for creating this, the new home of the BEST Sesshoumaru/Kagome fandom in the whole interweb world. I was around for the waning days of A-Single-Spark, and here for the early days of Dokuga. I was beta and cheerleader for one of the most inspired and inspiring Sess/Kag authors in recent years, the incomparable Demonlordlover. I have also beta-ed for some of the kindest, most imaginative, dedicated writers I may ever have the privilege of knowing. Despite life getting messy, I still make time to read and (infrequently, unfortunately) review stories that I find intriguing. Added 4/8/09: I just found out today that I can HAZ BANNER!! My thanks to the talented authors who thought my reviews were special enough to nom me in the Review Challenge... I likes BANNERZ, silly old thing that I am!!! Added 8/26/09: Today, I was gifted a beautiful new siggy by the lovely and talented Priestess Skye... THANK YOU!!! And got this nifty banner for doing so!! 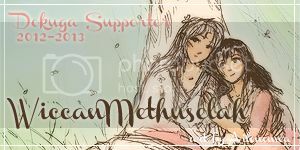 And SHADOW made me a BANNER! I do SO like BANNERZ!!! AND, Aviel made me these two TERRIFIC banners, out of the goodness of her heart! *Edited to include DISCLAIMER! 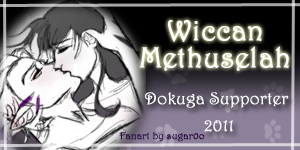 * Nominated Best Drabble, Dokuga Awards, 1st Quarter! Joint Second Place Winner, LiveJournal community ebony_silks, Week 42, prompt "Wax." My first attempt at writing anything Sess/Kag OR fiction for posting in an open forum. *Edited to include DISCLAIMER* Joint Second Place Winner ebony_silks Drabble entry, Week 48, \"Illusion\" prompt. My SECOND attempt at writing Sess/Kag AND fiction. My only excuse is that my friends keep encouraging me. In which Sesshoumaru gets educated on yet another human failing... This is a drabble I did for the Tree Prompt in iy_themes community on LiveJournal April, 2009. I just thought it would be nice to keep track of it here! This is what happens when I get coaxed into chat... proceed at your own risk! Mix of Canon and A/U. You're very welcome, I'm so glad to be a part of such a great community as we have here. Thank you for all of your work for keeping Dokuga going! 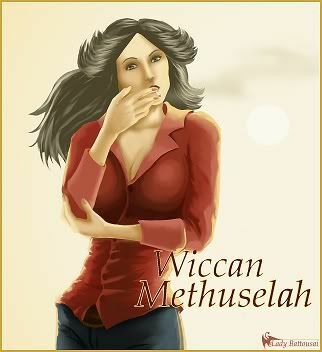 Thank you so much for your lovely review Wiccan, your words mean a lot to me, I'm delighted you enjoy my writing! Also I'll throw that right back at you: THANK YOU for all your hard work! So I actually screamed when I saw you reviewed Liberation. But, thank you so much for your kind words! I would be honored if you would take the time to comb through it, also I am so glad you liked it. Hey! Just thought I'd say thanks for looking after the site all these years. This has been my home away from home and I'm always grateful that I have a place to come back to and read all my favorites. Thank you for your review. I'm glad you're looking forward to my writing but I'll be honest: law school started and while this orientation week, things are slow, I'm already feeling the brunt of getting back into work mode. I will continue to write though and am very happy that someone as talented and amazing as you took the time to read and enjoy my story in your busy schedule. Aww, thank you Wiccan. Glad I brought some cheer to your dash. Thank you for the Birthday wishes! It was really nice to wake up to a flooded phone inbox this morning. I'm very happy that you enjoy this story so much and you consider it quite well written. It really is a joy to know how many people continue to enjoy this story. I'm just glad to share it with such a supportive community. Thank you again! Hey, stranger! I'm glad to hear that you are still enjoying Nefarious. As for my characterization of Sesshoumaru... I've gotten ragged a few times by people saying that Sesshoumaru doesn't act like I write him, that I make him look weak, and that he hates humans and Inuyasha and blah, blah, blah. And I can't help but wonder if they missed the whole last season of the series - or even the entire series in general, because we see him grow and change so much in it that he's not the same as he was in the beginning at all. In fact, over on my devart account a few weeks ago or so I found an art someone did of different anime characters - but ones that were in her words 'pure evil'. She had Sesshoumaru in that art! I was like... Oh, HELL no! And even when I pointed out to her that he wasn't evil and how could she possibly have thought that, I had to conclude that she didn't watch past maybe the first season or read the manga either, because she got all huffy with me and said that it was her opinion and that he's evil. Just thinking about that makes me want to pull out my hair, lol. Anyway, I guess this is just how I see Sesshoumaru. Like I wrote in Illumination - Sesshoumaru isn't going to allow anything to defeat him - not even himself, and so he will change as he needs to, because those that cannot change will eventually die. "And of all things, this Sesshoumaru will always survive." He's quiet a lot, so what do people think he's doing? Thinking. I see him as very introspective as he grows into his power and learns the lessons his father was trying to teach him. I guess this is why I just love Sesshoumaru so much. RT did an awesome job creating her characters, but she left so much open - there was so much more that she could have done with them, so much potential wasted. Okay, now that I've typed two pages of my own brand of mouthiness, lol, this old lady needs to get back to work on her original novel, since my own characters (that are based on Sess/Kag sorta, lol,) are bugging the hell out of me to get several more scenes and chapters done, standing over me with the whips and whatnot. So off to work I go! Hope you have a WONDERFUL weekend, m'dear! Oh, dear - I hope you didn't get any funny looks or trouble for the bouncing around at work, lol. I sometimes forget that in these new days of high technology people can access the web from their phones, tablets, and computers even at work, and I'm just waiting for the day when they start doing implants into people's heads that allow them to access everything with just a thought. (I guess I'm just too old - I still remember the now defunct art of reading actual BOOKS that were printed on PAPER, when there was no such thing as spell check, you had to look the word up in the dictionary or ask the local living dictionary how to spell the word, and the days when telephones were just landlines owned mostly by AT&T, which company charged you an arm and a leg to call anyone outside your immediate area code - yes, I'm speaking of LONG DISTANCE calling - a term this younger generation doesn't even know, lol. The good old days when the term 'cell phone' didn't exist, let alone the world wide web.) I am sure you know the obsolete things I'm speaking of! But I AM glad that we all have Dokuga - I can't imagine going back to the days without it! And I'm even more pleased that you were so happy to see a new story from me, and I hope I can continue to deliver happiness to your inbox! Loved your review on The Snow Angel. Been a long time since anyone but me called me the Queen of the cliffhangers. Kinda missed it. I honestly didn't plan it that way. If I hadn't posted an extra chapter way back when cuz they were all short, she wouldn't have died until tomorrow and there'd be no fuss. I think I got more reviews today than any other posting day for this fic. Guess I'd better not be lazy tomorrow and not post, huh?